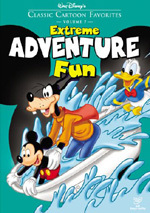 These five classic, time-honored stories, carefully chosen from the Disney vault, are sure to delight and entertain your child for years to come. You'll laugh as Mickey plays both roles in "The Prince And The Pauper," and similarly enjoy the two Academy Award(R)-winning shorts "Three Little Pigs" and "The Tortoise And The Hare" (Best Short Subject, Cartoon, 1932-33 and 1934). With beautiful animation, unforgettable music, and ageless themes about liking yourself for who you are and the value of preparing for the future, this collection of Timeless Tales is a must-own for every family. Disney aims their “Treasures” collections at the serious fans and shoots for more casual admirers with shorter, cheaper compilation packages like this one: Timeless Tales, Volume One. This one follows a fairy tale theme with it components. The fans who bought all the “Treasures” will already own most of these shorts via a combination of sets. “The Prince and the Pauper” comes from Mickey Mouse in Living Color, Volume 2, while “The Three Little Pigs”, “The Tortoise and the Hare”, and “The Grasshopper and the Ants” all appeared on Silly Symphonies. This makes “The Pied Piper” currently exclusive to this package. If/when Disney gets around to another Silly Symphonies treasure, I’d expect it to appear there. For each short, I’ll offer the year in which it was produced. I’ll also provide a quick synopsis of the cartoon plus my number grade for each one done on a scale of 1 to 10. The Three Little Pigs (1933): Two pigs build crappy houses because they’d rather play all day. Their third brother does things right and builds a sturdier home. The other two crawl to him when the Big Bad Wolf destroys their flimsy abodes. One of the most popular shorts of all time, “Pigs” played very well in the Depression, as it took on extra meaning. “Who’s Afraid of the Big Bad Wolf?” also became an enormous hit. More than 70 years later, the social issues don’t mean as much, but it remains an entertaining piece. I have to like a short that shows a portrait of the pigs’ father as sausage and a ham hock. 7/10. The Tortoise and the Hare (1934): When an overconfident rabbit wastes his time during a race, the slow but steady turtle beats him. This short doesn’t compare to the raucous humor of a similar Bugs Bunny cartoon, but it has its moments. It remains charming and fairly amusing, even if the Hare is awfully annoying. 7/10. The Grasshopper and the Ants (1934): A grasshopper sings and plays all summer while the ants prepare for the winter. When the snow comes, he’s literally left in the cold while they party, party, party. Hmm… anyone sense a theme of “don’t play while there’s work to be done?” It’s also odd to hear Pinto Colvig use Goofy’s voice for the Grasshopper. This one beats us over the head with its moral but has enough easy humor to make it enjoyable. 6/10. The Pied Piper (1933): When rats overrun the town of Hamelin, who they gonna call? Some twit with a pipe. He plays beautiful music that lures the rats out of the city… and then takes the local kiddies when their ungrateful parents refuse to pay for his services. Given that Disney was built on the success of a rodent, it doesn’t come as a surprise that “Piper” works best when it deals with the antics of the rats. They’re not as cute and fun as Mickey, but they’re not exactly vermin-infested beasts, either. The short loses steam when it moralizes, and the ending – in which the kids live in a world of candy – is simply bizarre. 4/10. The Prince and the Pauper (1990): This short puts Mickey in the classic fable. When compared to some of the others, it benefits from less familiarity. Not that “Pauper” presents a tale that’ll seem fresh, but at least it’s not been done to death. 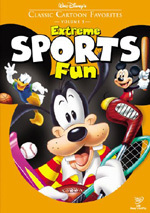 The cartoon uses Mickey in a dual role – as both prince and pauper, natch – and also features old stand-bys Donald, Goofy, Pluto and Pete. It’s not a great piece, but it works pretty well. 6/10. 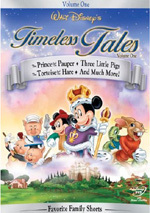 Walt Disney’s Timeless Tales – Volume One appears in an aspect ratio of 1.33:1 on this single-sided, single-layered DVD; due to those dimensions, the image has not been enhanced for 16X9 televisions. Since half of this package offered shorts from the Thirties while “The Prince and the Pauper” came from 1990, it made sense for me to look at the set in two different ways. For the older shorts, sharpness generally appeared quite good. At times, some softness interfered with the presentation; periodically, sequences looked a bit blurry or out of focus. This was especially noticeable during “Ants”, as it showed some rather soft shots. However, those instances seemed fairly infrequent, as the cartoons largely were reasonably crisp and clear. Jagged edges and moiré effects caused no concerns, but some light edge enhancement did seem visible on occasion. Print flaws varied but generally stayed minor for material of this vintage. Overall, the most significant issues related to light dust and/or grain along with some occasional marks, speckles, grit and blotches. A few examples of debris and spots occurred as well as a periodic flickering quality on the right side of the frame. Actually, the shorts remained pretty clean with the exception of “Pied Piper”; it displayed more problems than the others, as they were largely devoid of flaws. Colors usually looked reasonably good, but they also seemed somewhat erratic. Much of the time the tones appeared nicely bright and vivid. They stuck mainly with primary colors, though some of the shorts provided more varied and rich tones, and they normally appeared fairly lush and distinct. However, the hues could look somewhat drab and flat at times. They were never bad, but they occasionally lacked much depth and vibrancy. Black levels also appeared nicely rich for the most part, while shadow detail was clear and accurate throughout the shorts. As a whole, I was very pleased with the quality of the older cartoons. As for “The Prince and the Pauper”, sharpness remained positive. Virtually no examples of softness showed up during the short. The cartoon was always nicely crisp and clear. Jagged edges and moiré effects caused no concerns, and I also saw no signs of edge enhancement. A little grain crept in at times, but otherwise the image looked clean. Colors consistently seemed strong. The tones were bright and vivid throughout the shorts, with very few exceptions on display. The cartoons stuck largely with primary colors, and these looked quite distinct and vibrant at virtually all times. Black levels also appeared nicely deep and rich, while shadow detail was clear and accurate throughout the shorts. “Pauper” offered solid visuals. The monaural audio of the older shorts demonstrated the usual age-related concerns. Dialogue sounded a little edgy at times, but for the most part, the lines were acceptably clear and accurate. Effects showed a bit of distortion and harshness, but they stayed fairly clean and distinct through the shorts. Music also demonstrated variable levels of shrill and rough tones, but this wasn’t unexpected, and the score seemed reasonably solid. Decent depth accompanied some effects, but the track was pretty thin and tinny as a whole. Speaking of the score, I got the impression at least some parts of “The Pied Piper” were re-recorded. The music often sounded just a little too clear and modern. I also thought it sounded like it came from a synthesizer. I could be wrong, but I’d not be surprised to learn that short’s music was redone at a much later time. No significant issues with background noise occurred. The tracks seemed pretty clean for audio of this era. Overall, the sound heard during the Thirties shorts won’t win any awards, but I found the mixes to come across as pretty clear and accurate for their age. ”Pauper” presented a decent Dolby Surround 2.0 mix. It didn’t earn any accolades, but it featured a nice sense of general atmosphere. It also offered reasonably distinctive localization and stereo imaging. The surrounds were only moderately involved, though. The quality seemed fine. It showed nice delineation of speech, with good clarity and intelligibility. Music was fairly bright and bold, while effects sounded clean and accurate. Bass response was pretty solid and tight. Nothing here excelled, but the audio seemed positive in general. When we look at supplements, we get virtually nothing. A mix of ads appear under the Sneak Peeks banner. This area includes trailers for Cinderella, Kronk’s New Groove, Chicken Little, Lilo & Stitch 2, The Parent Trap, Pooh’s Heffalump Halloween, and Kermit the Frog’s 50th Anniversary. Normally I recommend these compilations to casual fans, but not in this case. The five shorts on Timeless Tales, Volume One are pretty lackluster. Actually, all except “Pied Piper” are good, but I don’t think they stand out as exceptional. This set comes with a higher than usual list price of $20 – compared to the normal $15 – but doesn’t include more content. The other sets are as good or better and more of a bargain. It goes without saying that diehard fans should skip this one. They’ll already own four of the five shorts, and since the exclusive one – “Pied Piper” again – is a dud, it doesn’t warrant a purchase. 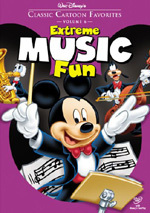 This is one of the weaker Disney compilations.